As a rule, most people try to avoid confrontations with their employers. They may fear being reprimanded or be concerned about facing further difficulties in the workplace. They may even worry about losing their job as a result of their actions. This scenario tends to differ dramatically when your boss is the biggest crime lord in the country- this is when it definitely pays to stay on their good side, because the consequences can be far more severe (and infinitely more fatal). When Jon finds himself on the wrong side of his employer- Oslo crime lord The Fisherman- he learns this lesson the hard way. After betraying his boss, and experiencing a failed attempt on his life, he soon finds himself on the run, ending up in the small isolated town of Kåsund- a mountain village so far north of Norway that the sun never sets. Here, he seeks refuge with a local religious sect- the Læstadians- whose simple way of life lies in stark contrast to the more chaotic city life that Jon is used to. With the guidance of a ten-year-old boy named Knut, his bereaved but strong young mother Lea, and town oddball Mattis, Jon hides out in an old hunter’s cabin in the middle of the wilderness. Despite occasional visits with the three, as well as the company of a lonely young reindeer buck which seems to favour the cabin’s vicinity, Jon finds the isolation close to unbearable. The constant daylight (the ‘midnight sun’), and the feeling that The Fisherman’s men are edging ever closer only add to his sense of insanity and foreboding. Will Jon be able to escape the impending doom that faces him in the arrival of The Fisherman’s men? If he is able to escape, will he stay in this barren, harsh, yet beautiful town? And what if there is more at stake than simply his own life? 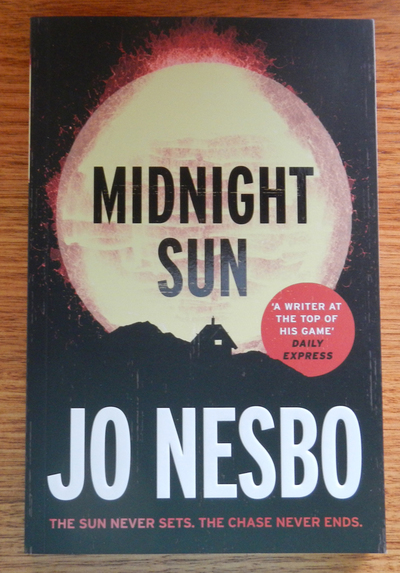 This is another brilliant stand-alone novel written by esteemed Scandinavian crime author Jo Nesbo. In a similar vein to his other novels, his main protagonist is deeply flawed, but despite this, is quite relatable to readers. The story of Jon’s betrayal of The Fisherman is gradually drawn out, and readers learn that his ulterior motive is not through insolence or greed, which further enhances his likeable nature. Readers, as a result, feel compelled to side with Jon after reading of his hardships and losses. The other characters are equally interesting- Knut is endearing as the slightly insecure but typically curious pre-teen boy, while Lea is the epitome of a strong-willed young woman who is determined to get by in the life she has been dealt. Mattis plays the roles of wise adviser, playful larrikin and wily businessman- all of which add to his charm. This novel, while relatively short, has plenty of suspense and intrigue, only a little bit of gore, and should satisfy most people who enjoy reading from the thrillers genre.